When you are a genealogist with an extensive family tree and you get a 2nd cousin match at Ancestry DNA , you expect to be able to find the relationship fairly easily. Never mind that this is my 2nd cousin’s once removed MM’s kit and that the new match has no tree, surely such a close match will want be in touch and know more? So I clicked on the View Match button. Sometimes there is is tree or two listed on the full match page that is just not connected to the DNA kit. No luck. Next I clicked on Shared Matches tab to see the matches MM had in common with this new cousin named A. The more relatives you have identified at AncestryDNA , the more useful this feature is. MM has my brother and a number of known Goodsell relatives in her match list at ancestry. 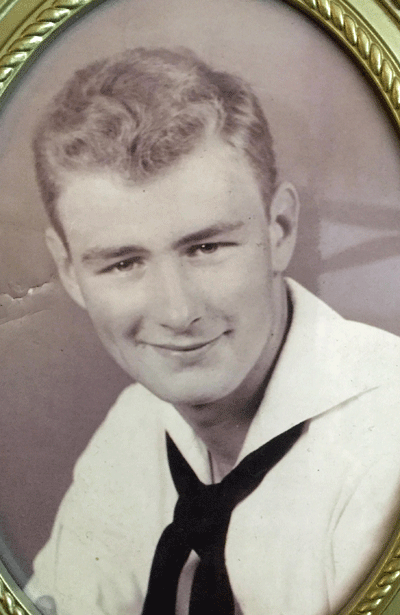 MM’s paternal grandfather, Charley Wold, is the brother of my Wold great-grandmother Maren. He married MM’s grandmother Martha Goodsell, among a number of other wives. We have lots of Wold relatives who have tested their DNA, but all at other companies. The shared matches showed that the new 2nd cousin A was in common with several Goodsell relatives but not a match to my brother’s kit. Now I lost interest since A was most probably not my relative. A second cousin on the Goodsell side would be descended from the parents of Martha, so I put this match aside for another day. However it is best to contact treeless folk as soon as possible after their data comes in, while they are still logging in and looking at their results. There are a few reasons people don’t have trees. The main two are that they are adopted or that they did the test just to see their ancestry composition. So I always craft a careful message that lets an adoptee know that I am willing to help, but hopefully does not scare off those less interested in genealogy. After a day or two I sent a message to A. This is roughly what I sent. I see that you have a second cousin match with my cousin. Apparently this would be on the Goodsell line because of the others you match. I know nothing about the Goodsells since they are not my relatives. I have been slowly filling in my cousin’s tree, see anything familiar? A week later she replied. She gave me two of her grandparent names which she told me were on a cousin’s public tree at ancestry. She also included her email address. I searched and found her cousin’s tree. Those two grandparents were clearly not a match for MM so I sent A an email asking if she knew her other two grandparents names. She sent those names and told me that this other grandmother was Irish so I eliminated her. That left her grandad Gordon Johnson whom she sent the picture of shown here. With a common name like that I did not expect much success. After a quick and fruitless look, I put this one away on my “to do someday” list. That was at the end of June. Over the summer whenever I had a little free time, I did more work on MM’s tree, building it forward from her grandad, my relative. MM has a big book with photos and family sheets which I had taken pictures of when I visited her last spring, ancestry kit in hand. Our mutual cousin Ed had been there too and had given me his part of the tree. So I continued to enter their data, using censuses and those green leaves at ancestry to fill more in. MM’s grandad had 26 children so there are a lot of people in her tree. One fine September day I got an email from a Wold related 4th cousin asking if the new Wold test she was seeing was one of ours. So I opened MM’s results and found that another Wold cousin had tested at AncestryDNA , with the same name as my known 3rd cousin (MM’s 2nd once removed) . Sure enough, MM showed a 3rd cousin level match with him. I sent his son a note asking if that was really his Dad and eventually found out that yes it was. 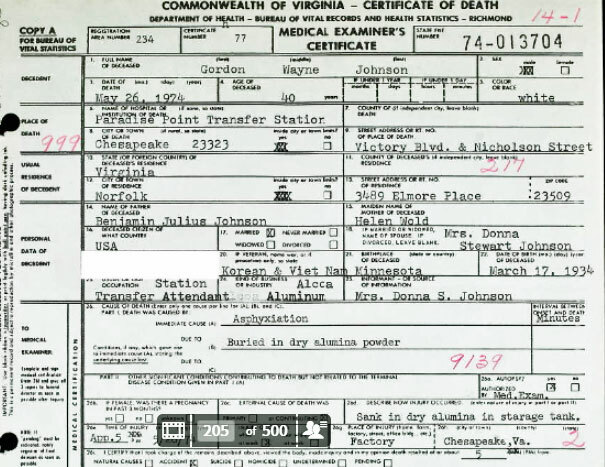 A scan of the seven siblings of MM’s dad showed that one sister did marry a Johnson and had a son named Gordon! How did I not remember about A when I entered that data? Maybe it was a late night green leaf click or more likely I was just not expecting him on that part of the tree … Now I cross checked the facts that I had from A with MM’s tree and did some research at ancestry to be sure. A had mentioned that her grandfather had died when her mom was 12 and he was on active duty in the Navy. I found the horrifying death certificate, partially shown below, which confirmed his parents, his Navy career, and his early demise. He died of an accident when only 40 years old. He fell into a vat of alumina and suffocated. Click here for his find a grave memorial. By now it was two in the morning. I get excited by new genealogy discoveries! I sent A an email, copying MM, welcoming A to the family with links to the Wold family history and my blog post about my trip to the ruins of the family home in Norway. Even though it had been a few months, A wrote back right away the next morning. MM and I are very happy to be in touch with her and to tell her more about her grandad’s family. This is a lesson for me to never ignore a close family match! And to be careful about making assumptions from those shared ancestry matches when not that many of your relatives are tested there. have you met our other cousin in georgetown? I am banging my head against the wall. Working on Ancestry, I have identified matches that are not on my birth father’s tree, so must be on the other side. Many of them share matches with each other as well as myself. I have built an extensive tree, that albeit still has to have some important gaps, but I am unable to find a person that matches some particulars I was able to dredge up. 194 cms, 167 cms, 163 cms, 156 cms, with various segments. The very first two matches, and the closest, the first will not communicate with me. After a couple of very short emails, they dropped off the planet. The first has a tree, with no one common with any of my other matches. The second has a tree,and they fit into mine. They were raised by one parent since age 5, and have had nothing to do with the other parent’s family, and do not appear to want to share. I also do not feel like the next two have any interest in uploading their dna to any other sides, so it looks like Gedmatch is out. With what I’ve been able to read, it would appear that I am more fortunate than many wth so many close matches. But I’m stuck. I have built a tree on What Are The Odds, but the only thing it really did was push the second group of matches away. I am beginning to think I am dealing with a half relationship somewhere upstream, and that some of these close matches are 1/2 cousins instead of full. That or an adoption upstream somewhere. How much wine would it take for you to do a drive-by and tell me if I’m missing something that would be painfully obvious to anyone else? Good that you have done tree building, that is what you have to do here. Do not worry two much about the particulars, they can be somewhat inaccurate in my experience. Your birth father is likely the child of a marriage (or affair) between those two families so have you found that? Or a location people from both families were in? Do you know how the first group is related to each other? How about the second group? My paternal side and tree is pretty clear. My birth father has passed, but his nephews and I have communicated. One is 822 cms, so the relationship is pretty much assured. His whole family tree and my shared matches with him all line up on that side of the family. that is my theory as well. The only person on my maternal side I cannot find a place for is the first or closest match. Everyone else down to fourth cousins I have found a place for in my tree. The first shared match does not share anyone in their public tree (nor the tree I built out based on theirs) with the rest of the group of shared matches on this side. They are at least a generation younger that I am, so my first thought is 1C1R. But if I throw 1/2 cousins in there it gets really messy. It is interesting that out of the five closest shared matches on this side, the first and closest is not a match for one of the other relations. That seems like a likely smoking gun. One shares 477 cms with me, and the other shares 245 with me. Yet, all of these matches match each other as well as me. Its either that, or that quirky randomness of dna is playing another trick! I know we are communicating by email so I won’t pursue this thread here unless you think it beneficial. Likely this closest match is related to your BM on a different side from the other good matches, in other words, the other parent of your BM. Sorry I just have very little tim this week, it may be another few days before I can review all that you sent me. Ah. I will look into that possibility. I am replying here as it seemed relevant to the thread. I was able to get a couple of cousin matches to give me their shared cms with a couple of other matches. So I started a McGuire diagram for this group. I have four matches I put into the diagram. They are #2, 3, 4 and 5 in closest matches. The #1 I still do not know where they fit. I am pretty confident in the family tree I built that includes these four matches. Three of them are second cousins by where they fall in the family tree, i.e., they all share a great grandparent. Two of them are first cousins once removed, as they share a grandparent. 127, 114, and 102 shared cms, 1/2 second cousins. 184 cms, 1/2 1st cousin once removed. Gordon W. Johnson’s son John has matched Kristine Wald Bartholomew 64 cM on 4 segments. Both John and Kristine would be direct descendants of Carl John “Charly” Wold, however descended from different ones of Charly’s wives…..